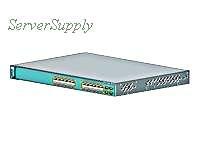 Cisco - WS-C3560G-24TS-S WS-C3560G-24TS-S Cisco Catalyst 3560 24 10 100 1000T+4SFP Standard Image. New Factory Sealed. Cisco - WS-C3560G-24PS-S WS-C3560G-24PS-S Cisco Catalyst 3560 24 10 100 1000T PoE + 4 SFP + IPB Image. New Factory Sealed. Cisco - WS-C3560G-24TS-E WS-C3560G-24TS-E Cisco Catalyst 3560 24 10 100 1000T + 4 SFP + IPS Image. New Factory Sealed. Cisco - WS-C3560G-24PS-E WS-C3560G-24PS-E Cisco Catalyst 3560 24 10 100 1000T PoE + 4 SFP Enhanced Image. New Factory Sealed. Cisco - WS-C3560G-24PS-S CISCO - (WS-C3560G-24PS-S) CATALYST 3560 SWITCH 24PORT 10/100/1000T POE 4 SFP STD IMAGE. NEW FACTORY SEALED. IN STOCK. SHIP SAME DAY. Cisco - WS-C3560G-24PS-E CISCO - (WS-C3560G-24PS-E) CATALYST 3560 SWITCH 24PORT 10/100/1000T POE + 4 SFP ENHANCED IMAGE. NEW RETAIL. IN STOCK. SHIP SAME DAY.